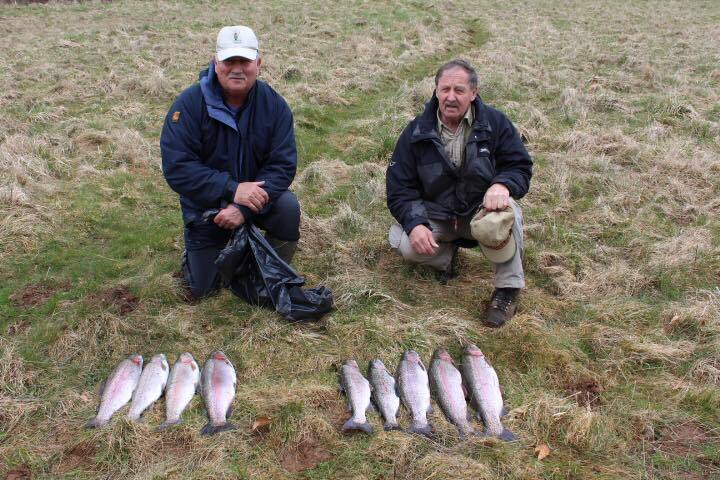 Exmoor Trout Fisheries for all. 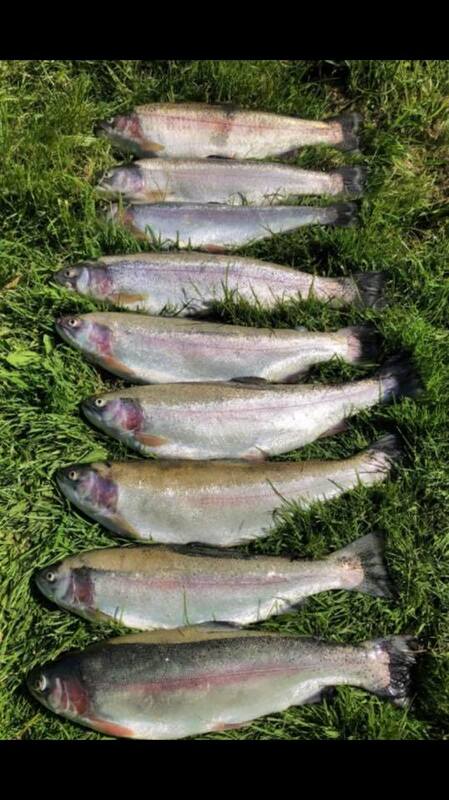 The above full tailed rainbow trout was landed by Nick Hart who runs the nearby Exe Valley Fishery. 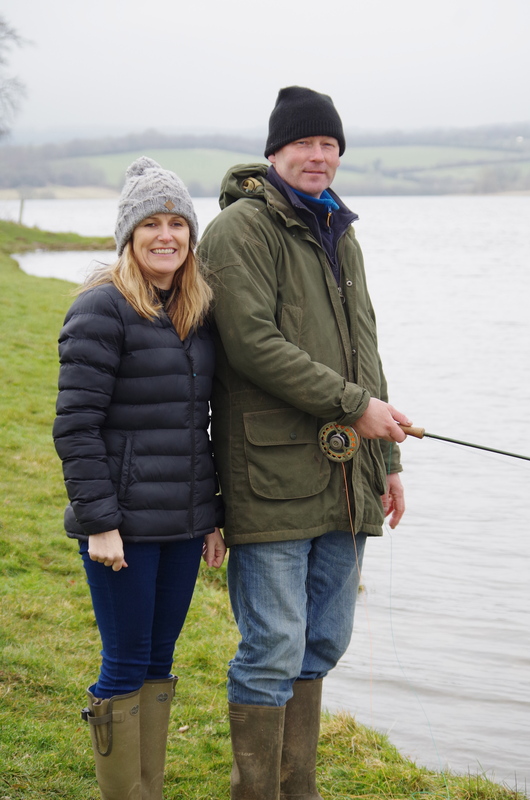 Wimbleball and Exe Valley offer Fly Fishers visiting Exmoor an excellant choice of venues. 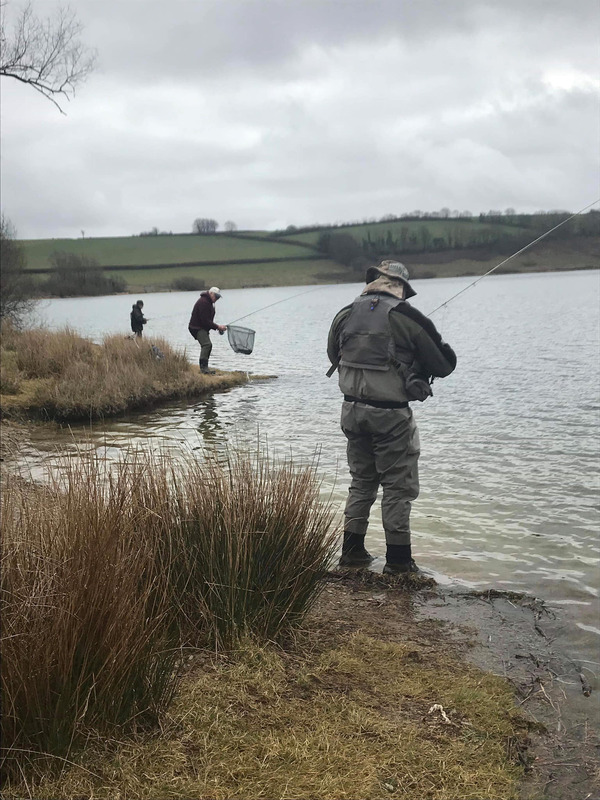 The wide open expanse of Wimbleball offers the challenge of hard fighting fish in a stunning setting of moorland, woods and extensive farmland. 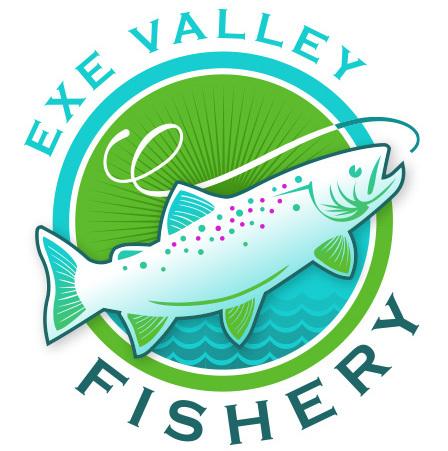 Exe Valley is situated in a sheltered valley beside the River Exe and offers fishing for both experienced anglers and families. 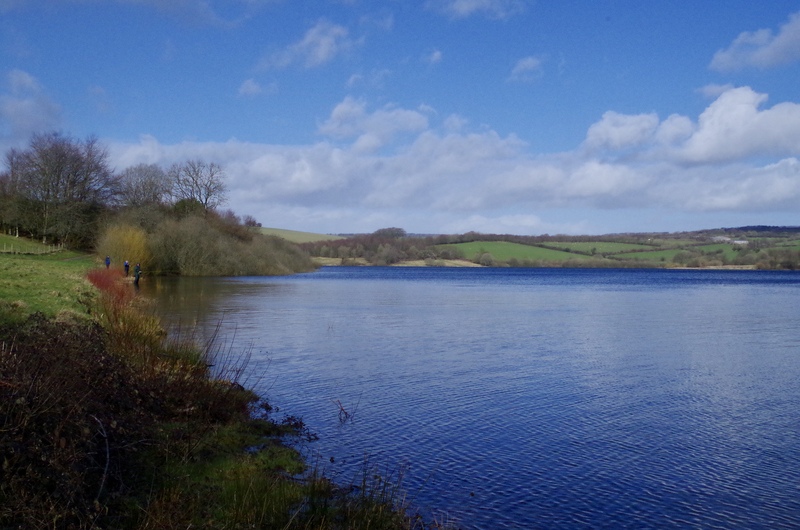 Being slight less imposing Exe Valley is an ideal venue for those wanting to try trout fishing before venturing out to the wild expanse of Wimbleball. 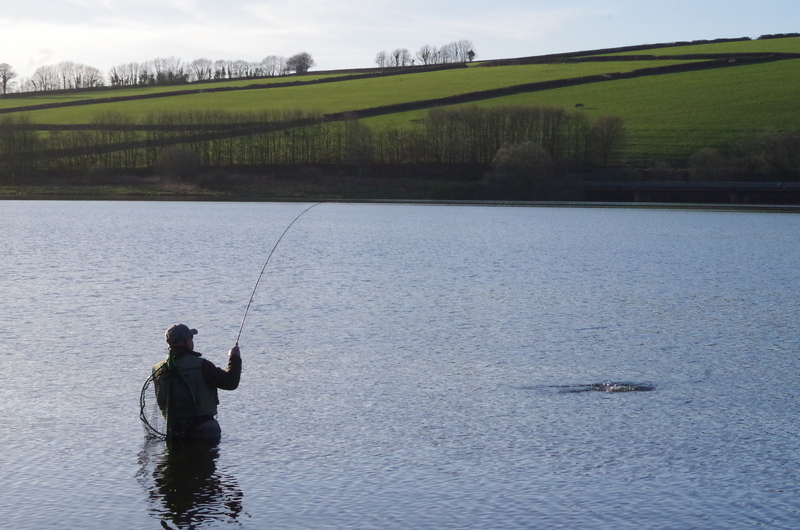 Exe Valleys tranquil waters offer great sport. 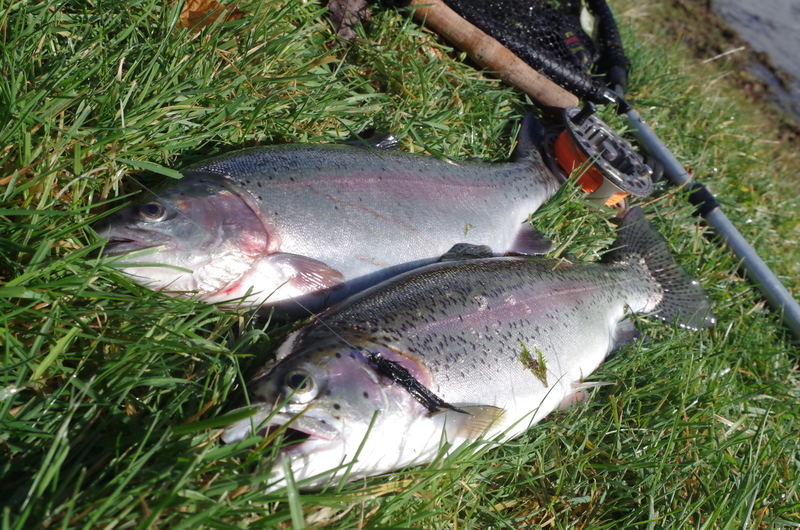 Both fisheries offer catch and release options with stunning brown and rainbow trout. 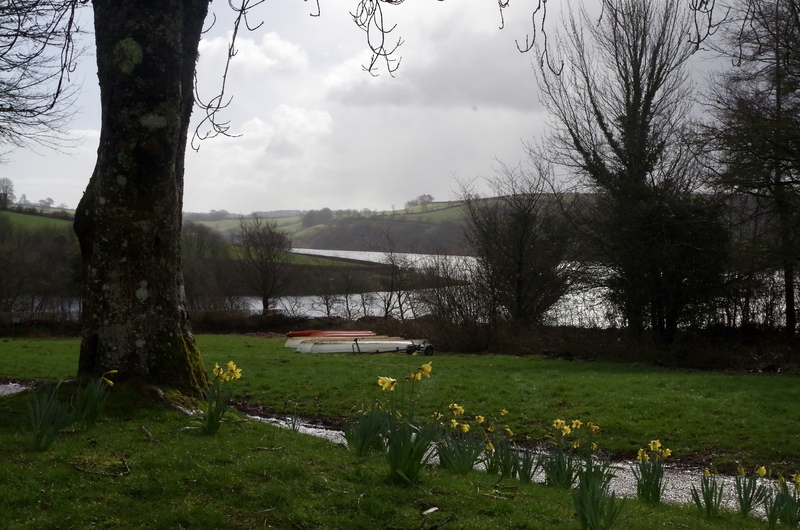 Wistlandpound Fly Fishers visit Wimbleball on a stormy day! 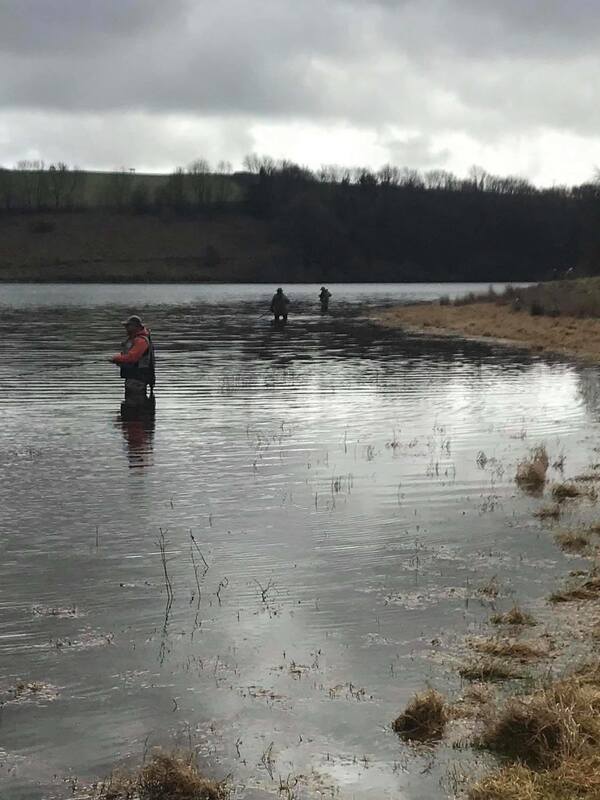 Wistlandpound Fly Fishing Clubs first outing of the season was to Wimbleball Reservoir high on Exmoor. 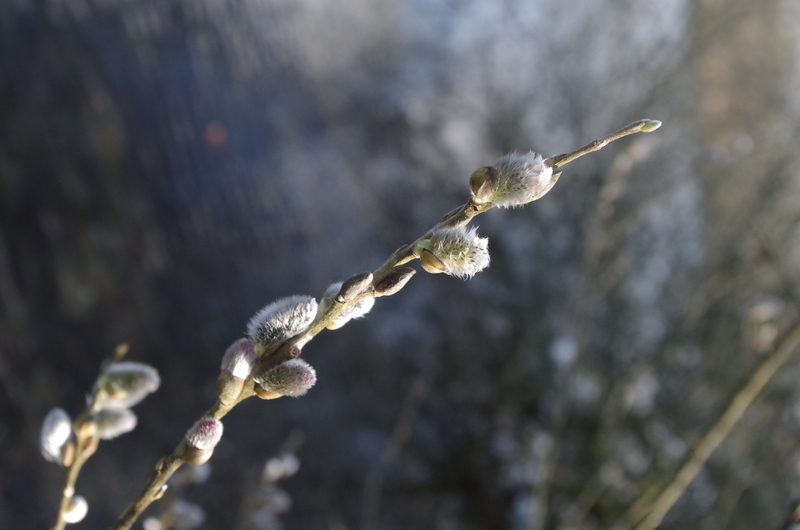 With gale force winds, hail, sleet and icy rain punctuating long sunny spells it was a day to wrap up warm. 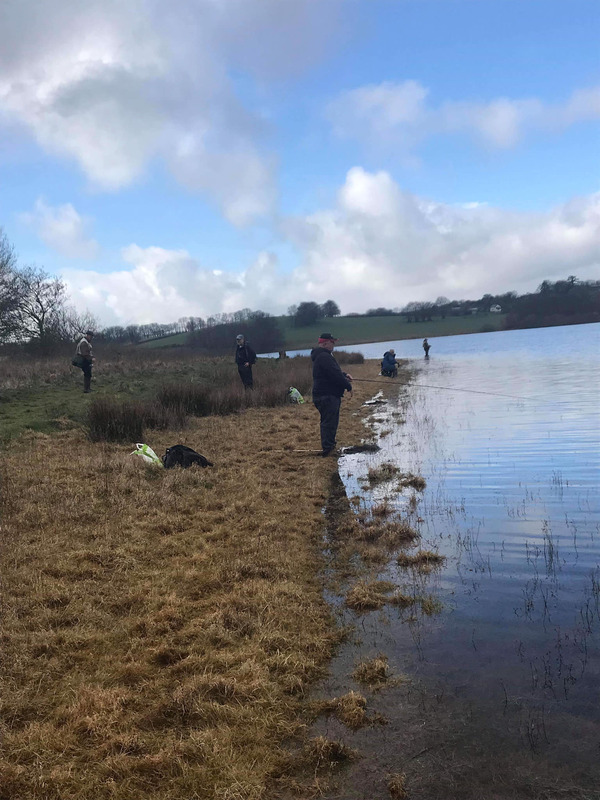 We arrived shortly after 9.00am and a glance through the catch returns showed that sport had at times been frantic over the opening week of the season with plenty of limit bags and impressive catch and release sport. 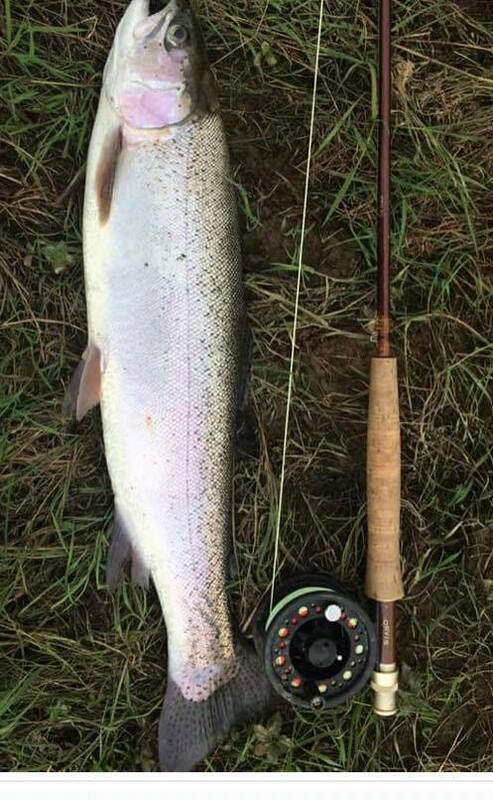 The size of trout was also promising with good numbers of fish over 4lb. I decided to start directly below the permit hut close to where the boats are launched as this bank had a degree of shelter from the gale force wind that was sweeping across from the North West. 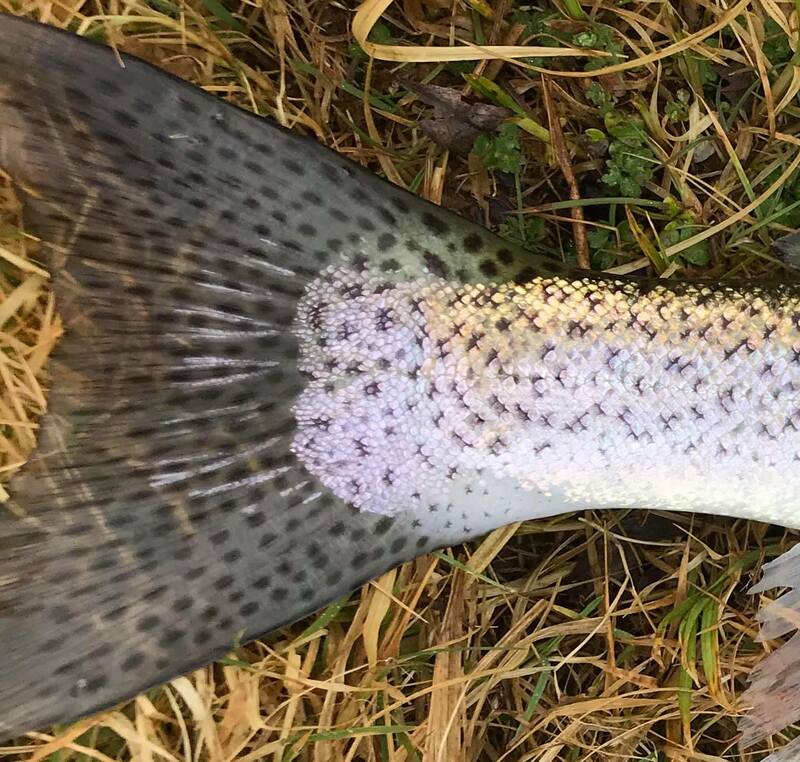 A large bead headed black lure presented on an intermediate line seemed an obvious choice this early in the season and the trout seemed to agree as I was into a hard fighting rainbow of close to 3lb on just my second cast. 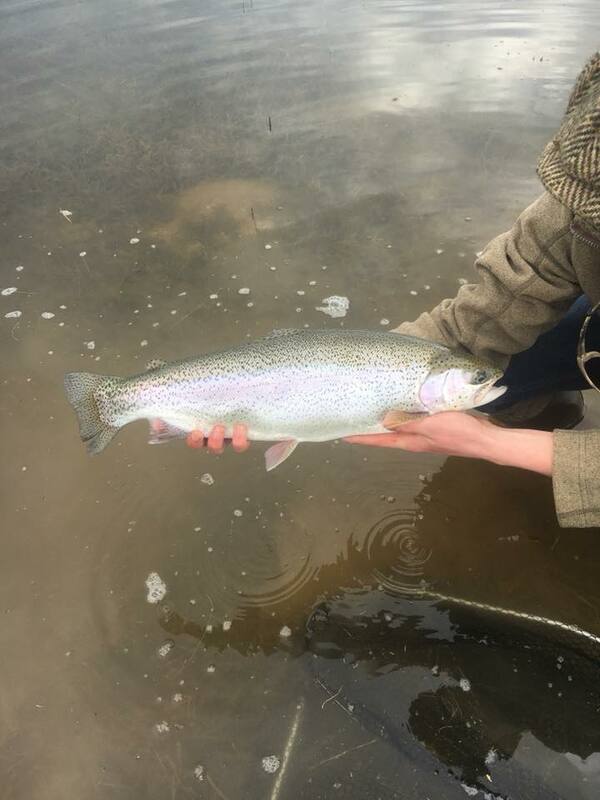 For the next half an hour I felt tugs at the fly on every other cast and briefly connected with another hard fighting rainbow before landing my second rainbow. 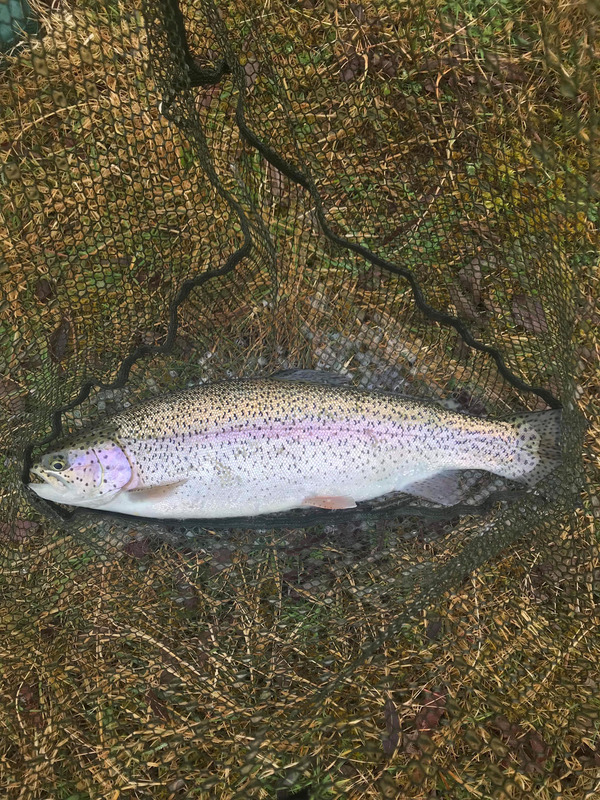 At this point I was expecting to bag up within a couple of hours but the trout had other ideas! I persevered with the same tactics for another hour but failed to get a pull. 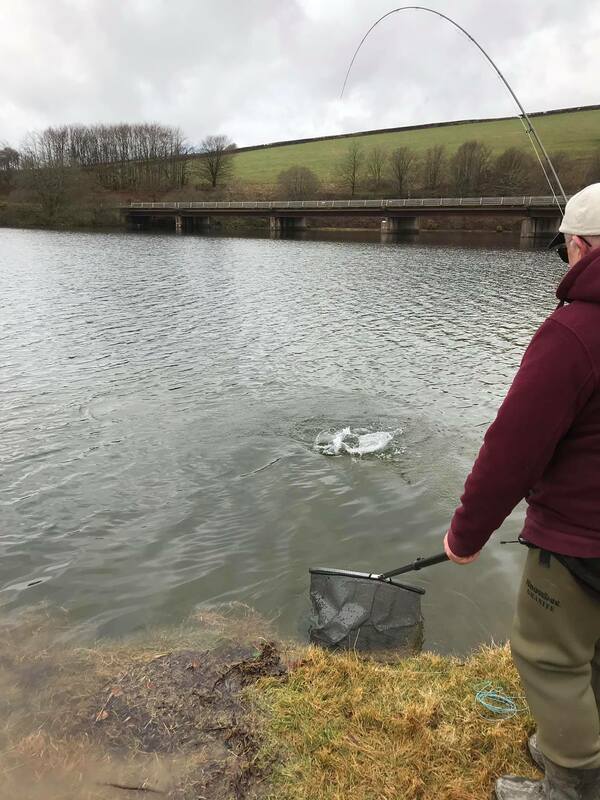 A move fifty yards along the bank brought an encounter with a stunning brown trout of close to 2lb that cartwheeled out of the water in flurry of spray. 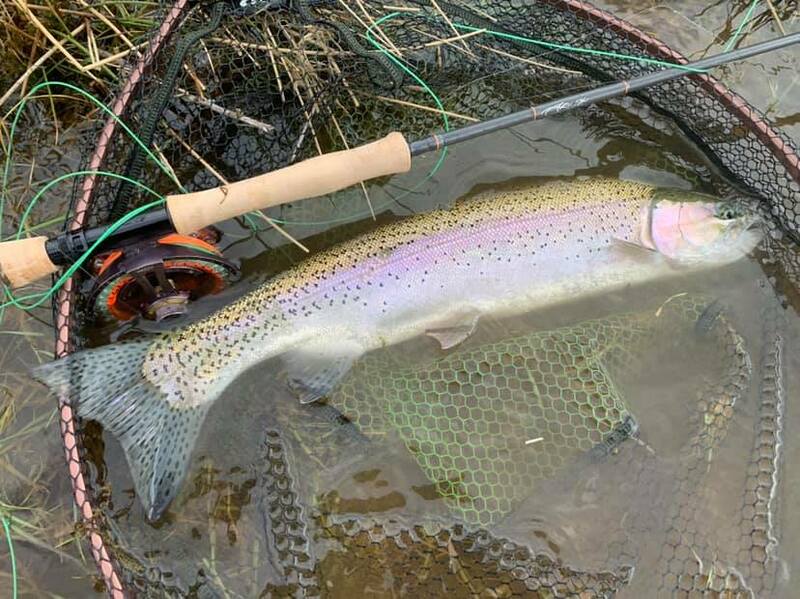 After a quick photo of the fish in the net it was returned and swam strongly away into the crystal clear water. 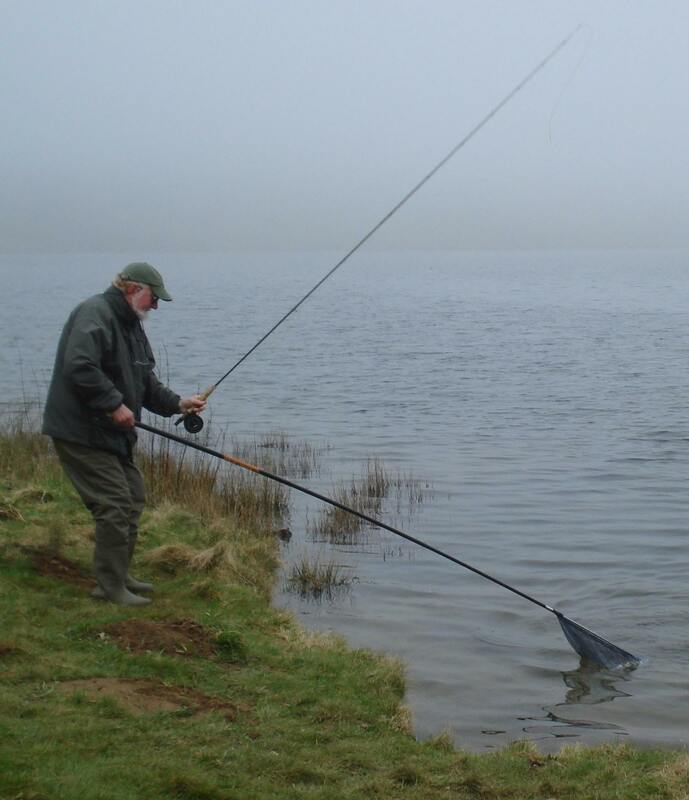 Talking to other passing anglers it was a similar story with sport drying up. I decided upon a move along the bank to where some other club members where fishing. Andre Muxworthy had already bagged up and told me he had landed all his fish within the first hour or so. 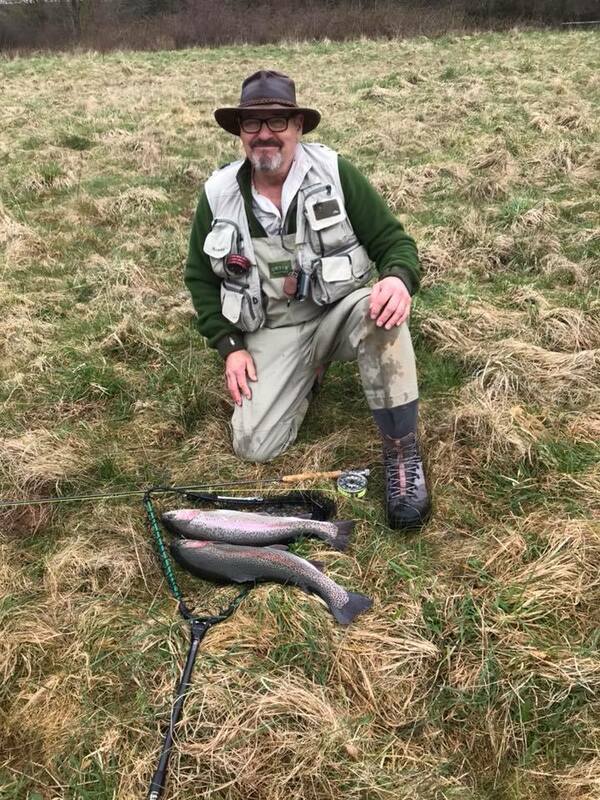 Whilst I received a couple more pulls at this location my score for the day was to remain at a brace of good rainbows totalling 5lb 8oz. The afternoon passed quickly by with clouds racing across the sky, Canada geese cackling on the lake and leafless trees dancing in the cold wind. After a day stood in icy water it was not too difficult to drag myself from the waters edge and return to the permit hut to weigh in. 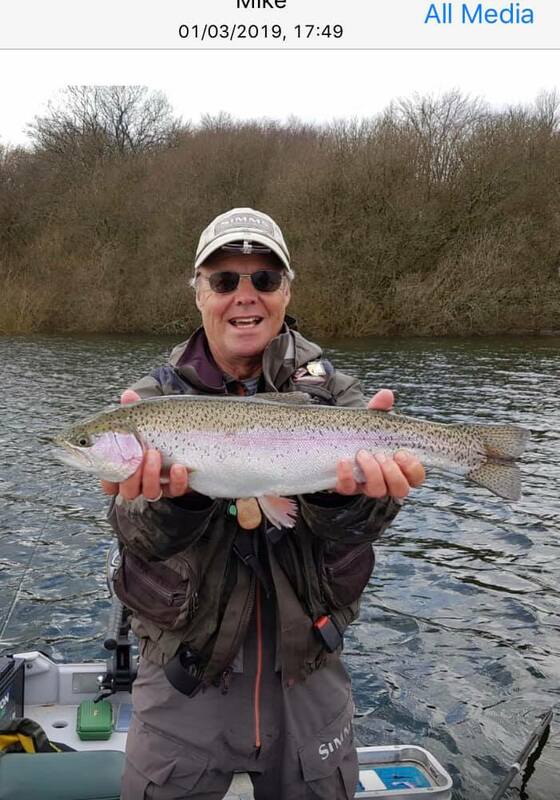 Andre Muxworthy with the best fish of the day a full tailed 5lb rainbow. 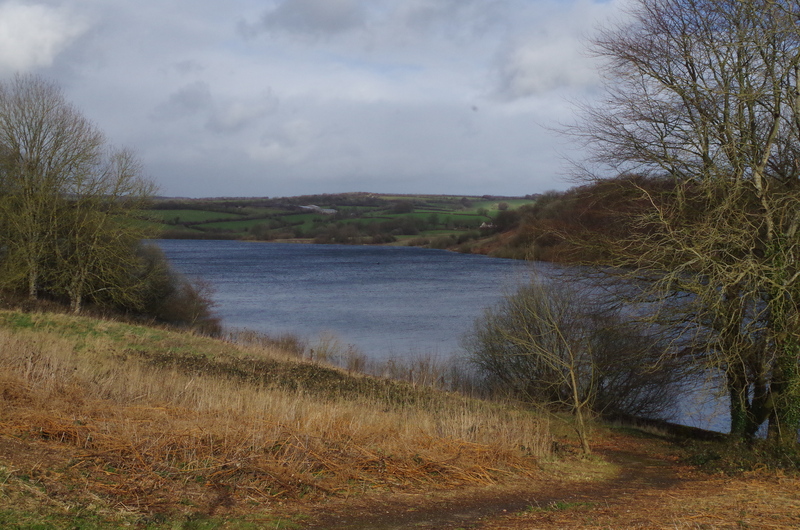 I hope to return to Wimbleball in a couple of weeks when with luck the weather will be a little kinder. 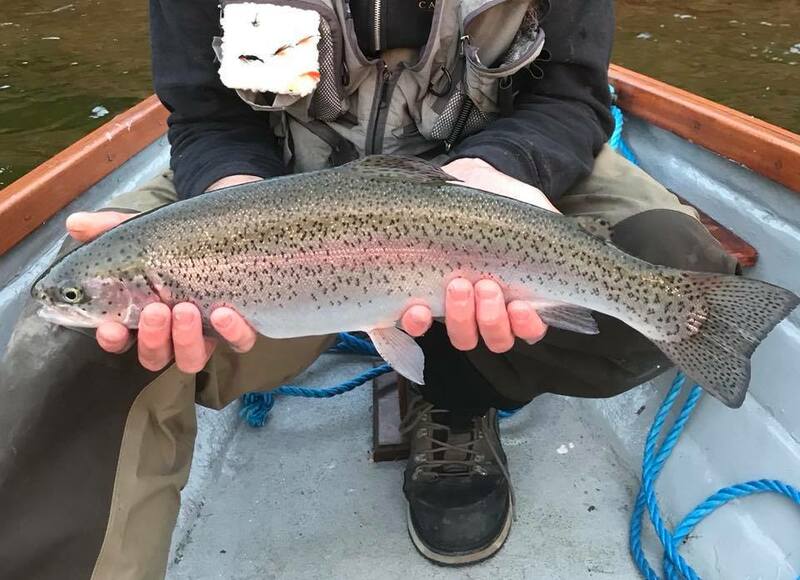 The fishing has been spectacular at times so far this season and even on this day when I and a few others struggled to catch one angler enjoyed a catch and release day with over twenty fish returned. 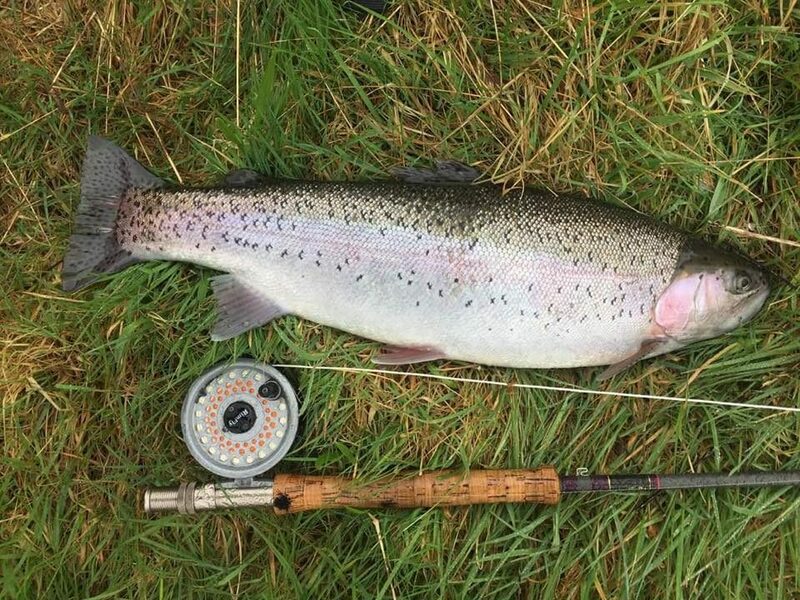 Early in the season with fish often tightly shoaled up location is often the key with black and green lures very often successful. 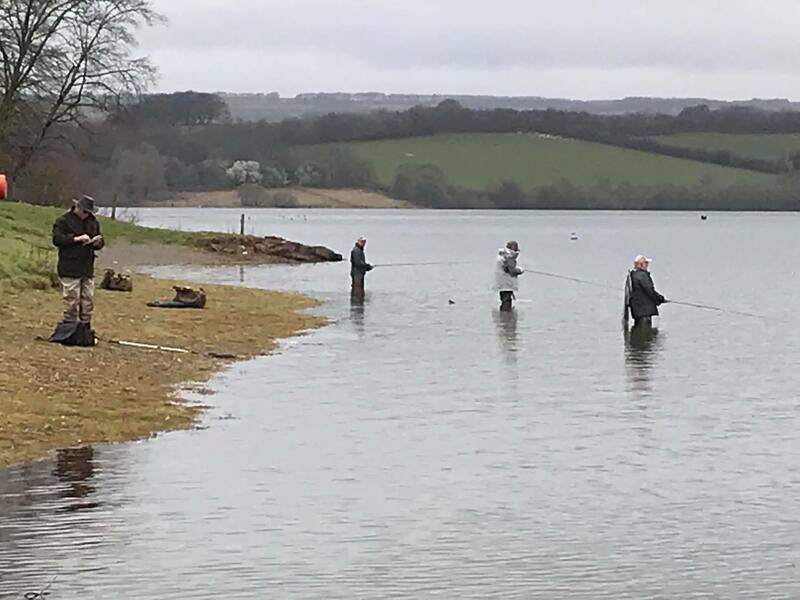 Over sixty fly fishers descended upon Wimbleball for the opening day of the fishery’s season and they were not disappointed with excellent sport savoured by the anglers with bent rods and screaming reels a plenty. 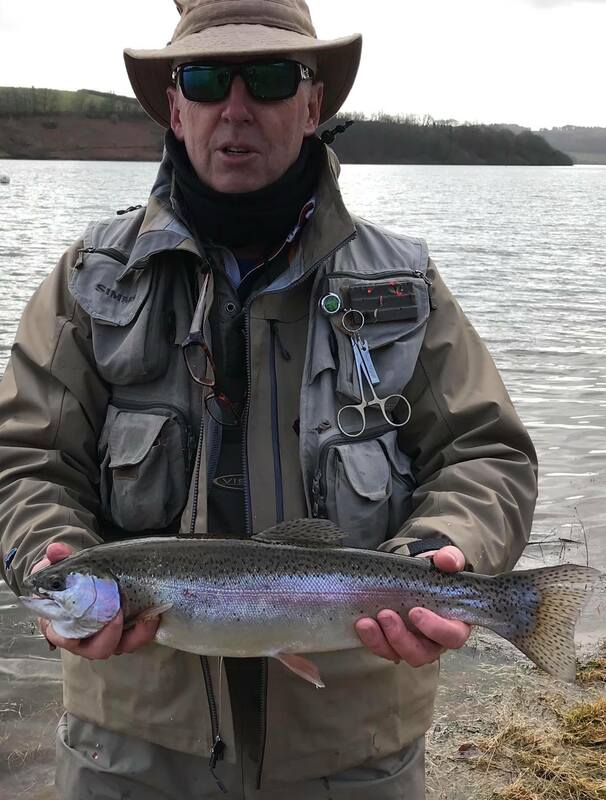 A New Season gets underway at Wimbleball Reservoir where expectations are high for some superb early season sport with hard fighting rainbow trout that have been stocked in good numbers. 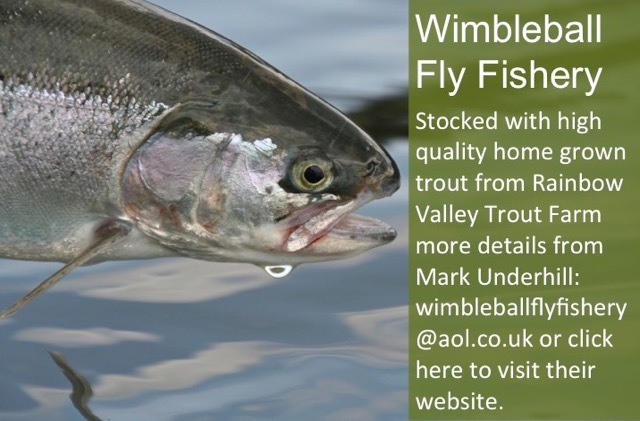 With mild conditions running up to the seasons start the trout should be moving well and eager to feed. Lure anglers will probably do well over the opening days with black often the most successful colour. 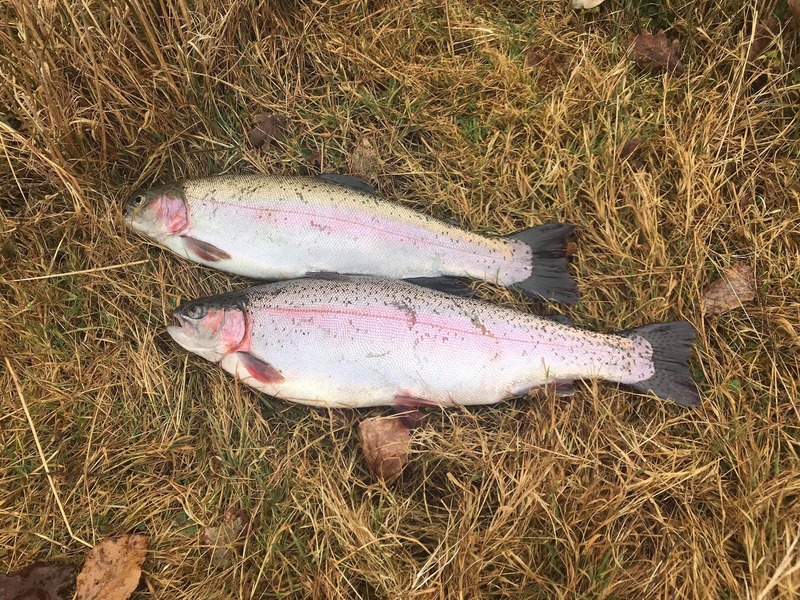 The fishery enjoyed a very productive season last year with excellent catch returns despite difficult weather conditions that saw the lake drop to very low summer levels. 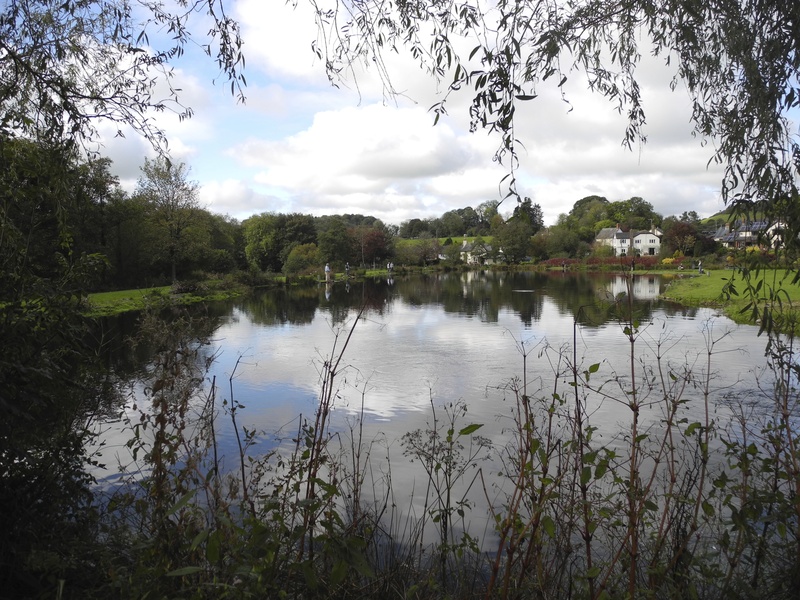 The lake is now close to full and should give sport from both bank and boat. 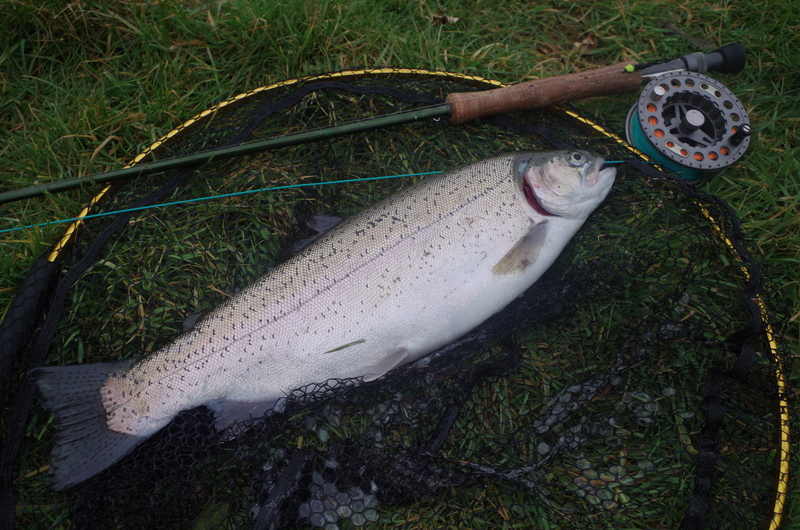 (Above)One of the 5 fish caught by Ashley Scott who tempted the fish on the coch bonddu beetle pattern. 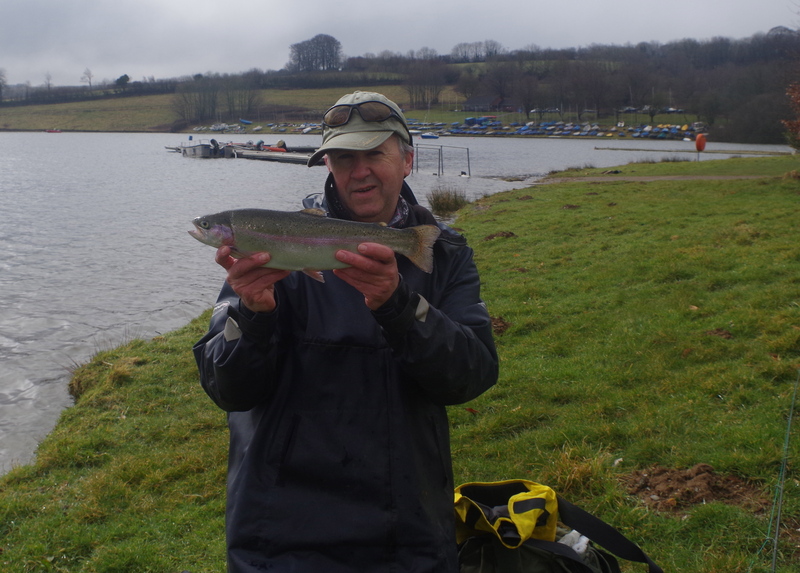 Sport has been excellent at Wimbleball with quality rainbows taking several anglers to the backing from both boat and shore. (Below) A none fish bag for boat anglers Brandon and Mark Hayward. 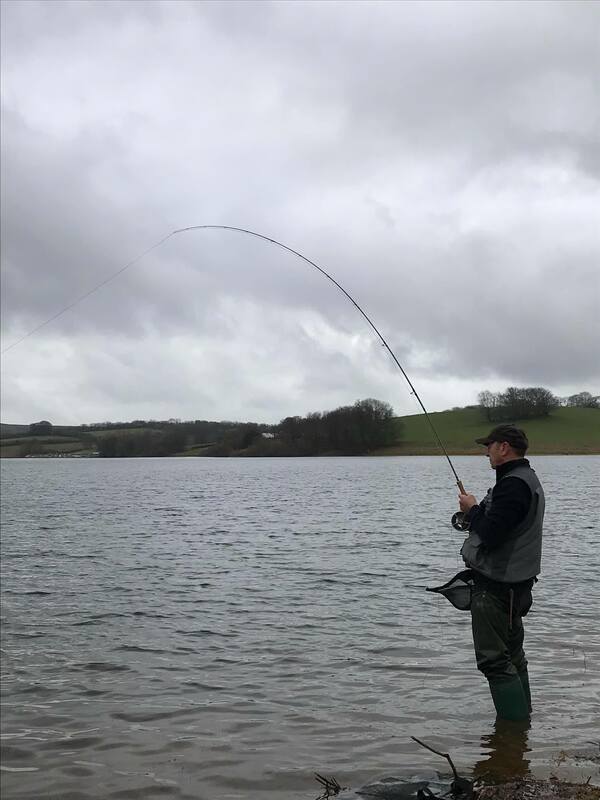 Wimbleball continues to fish exceptionally well as the season progresses with some superb catches to anglers fishing buzzers and imitative patterns. 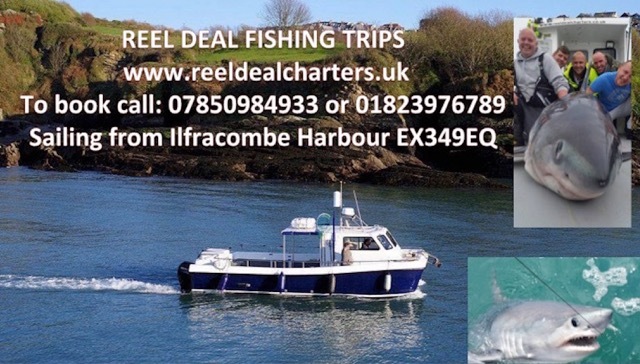 Th next couple of months offer some excellent prospects. 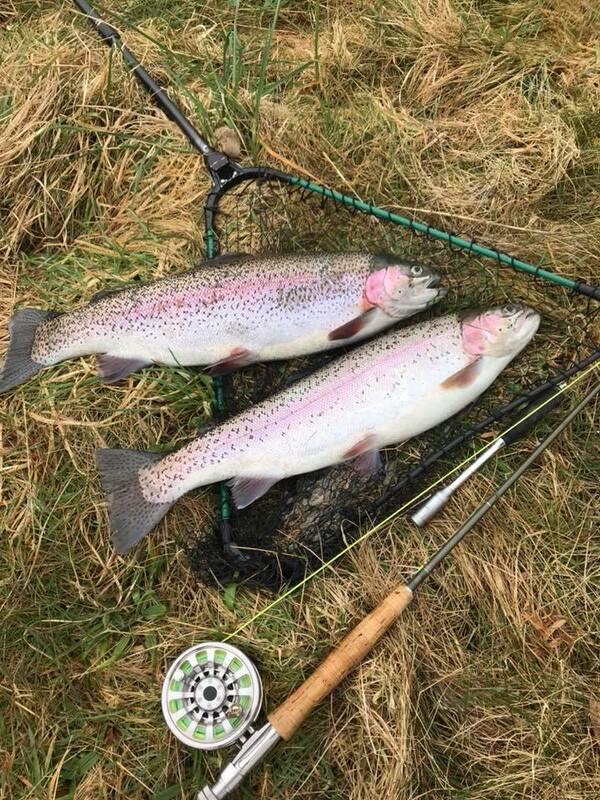 Peter Hughes enjoyed a superb day’s fishing today off the bank at Ruggs. 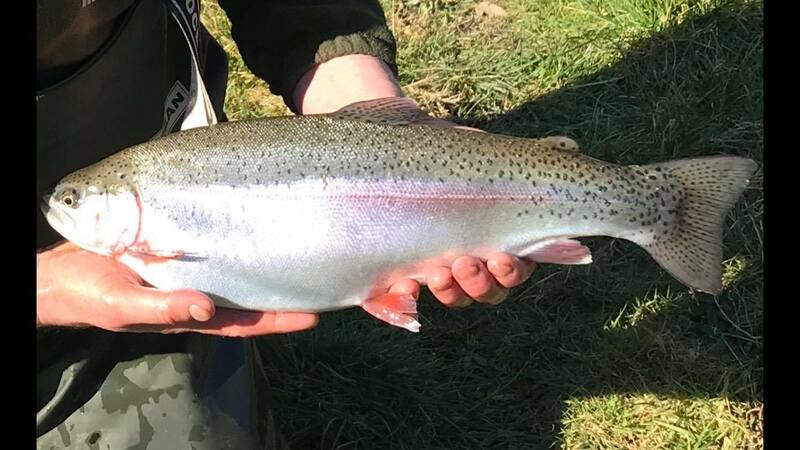 Despite bright sun and a strong, cold, North East wind Peter and his friend managed to entice 15 strong, hard fighting, bars of silver on a catch and release ticket. Brilliant fish and fishing with all fish coming to buzzer variants on floating lines. 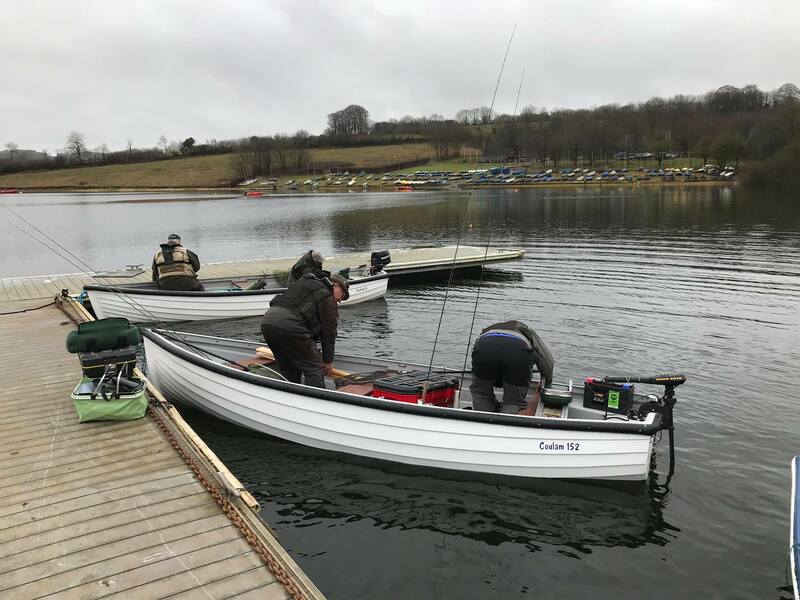 Simon Fuller and boat partner caught full bags from Cow Moor fish ranging from 2.8lb-4.8lb,and bank fisherman Ashley Scott bagged up at Ruggs with fish up to 5lb. 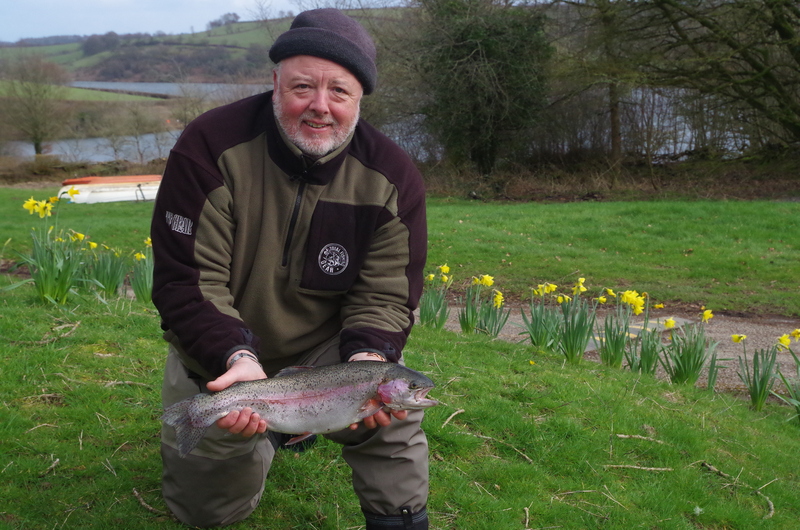 Wimbleball is in fine form with plenty of hard fighting rainbows being caught to 5lb. 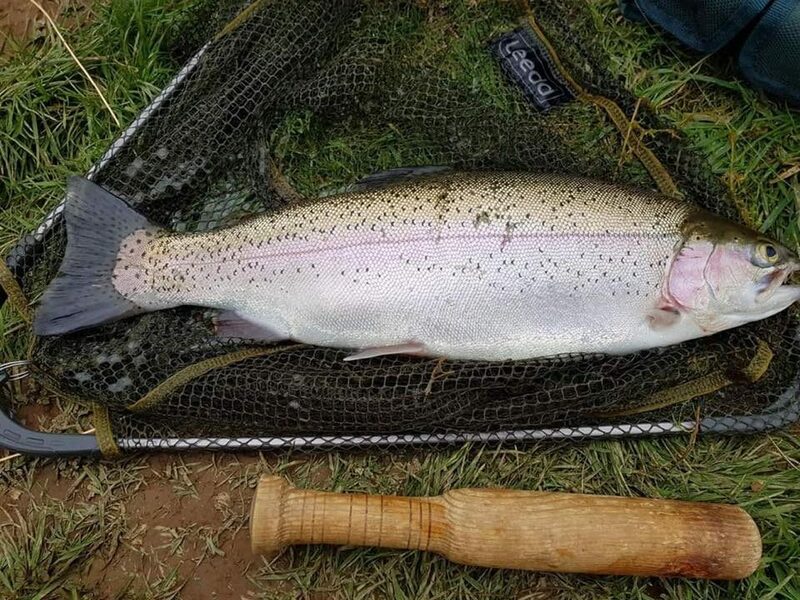 (Above) Another cracking Wimbleball 5lb fish caught by Toby Bennett at Bessoms Bay. 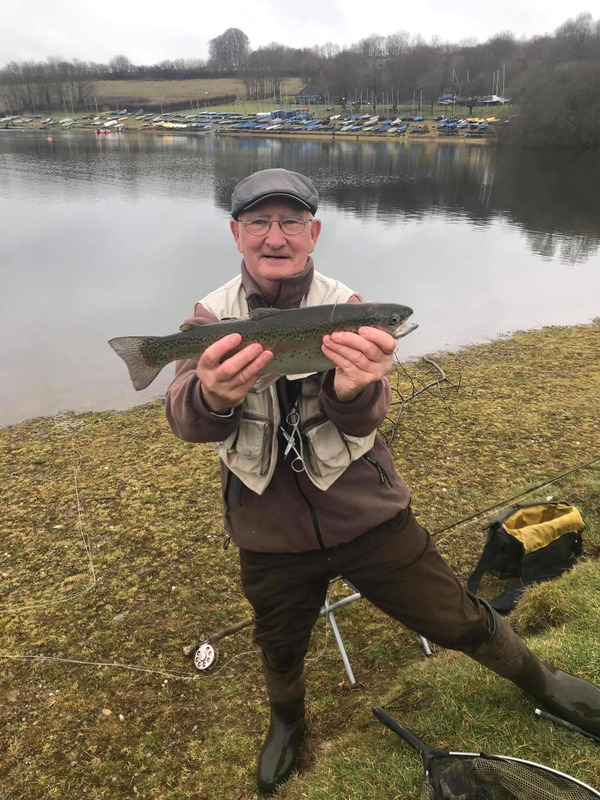 (Above) 4lb 10oz caught by David Gibson near sailing club bay. 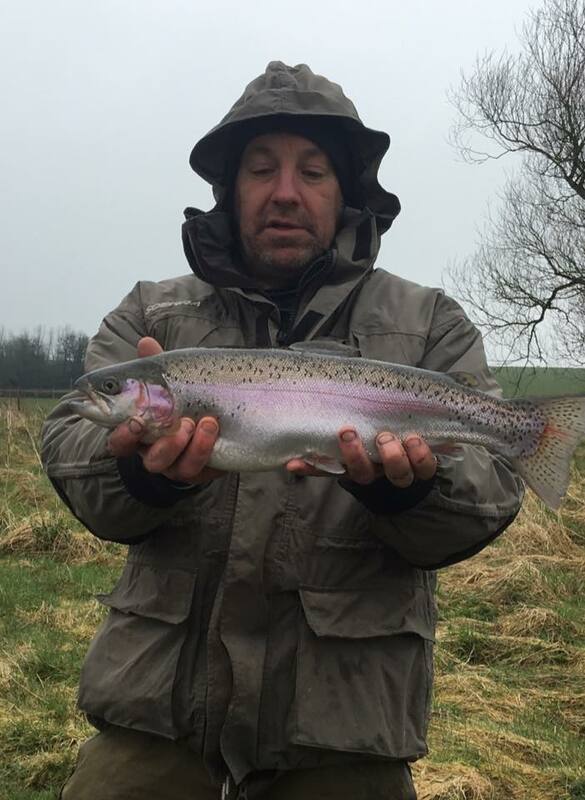 (Above) One of several quality fighting fit rainbows caught by Mark and Brandon Hayward. (Above) Another one in the net on a misty spring day. 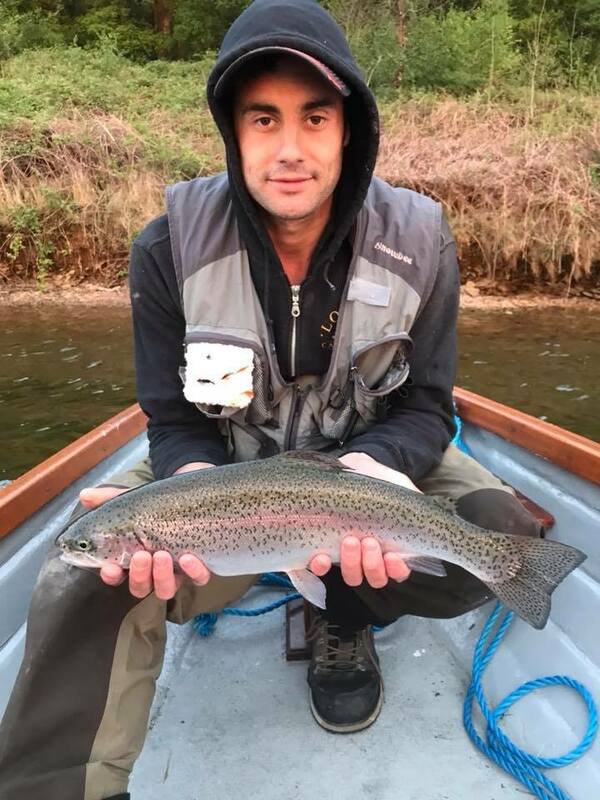 Wimbleball is in fine form at present with some stunning bags of rainbows caught in the opening few weeks with numerous fish topping 5lb. Surface activity has been great and should improve further with warmer weather on the way. 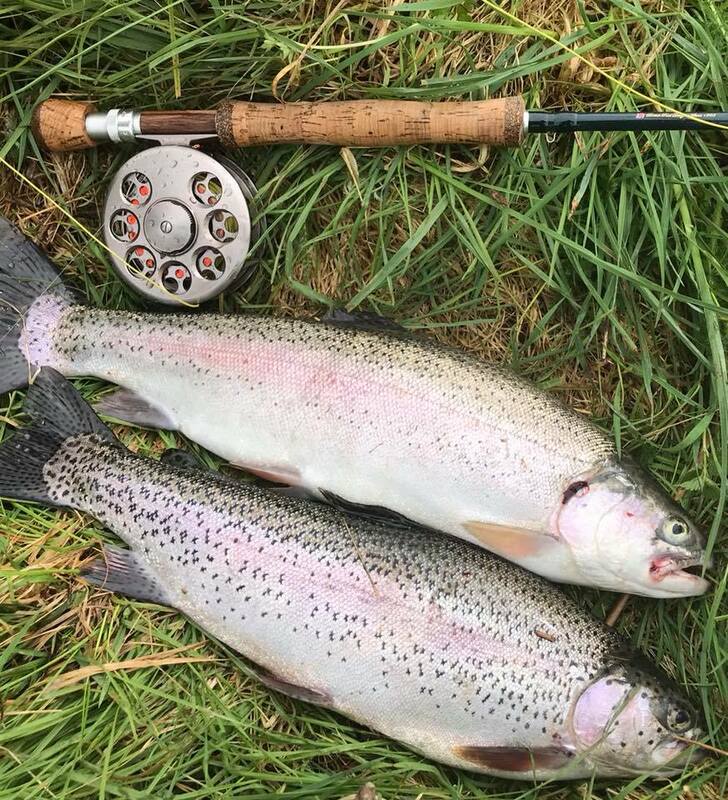 A very pleasing brace of 4lb-5lb rainbows caught by Richard Elbro. 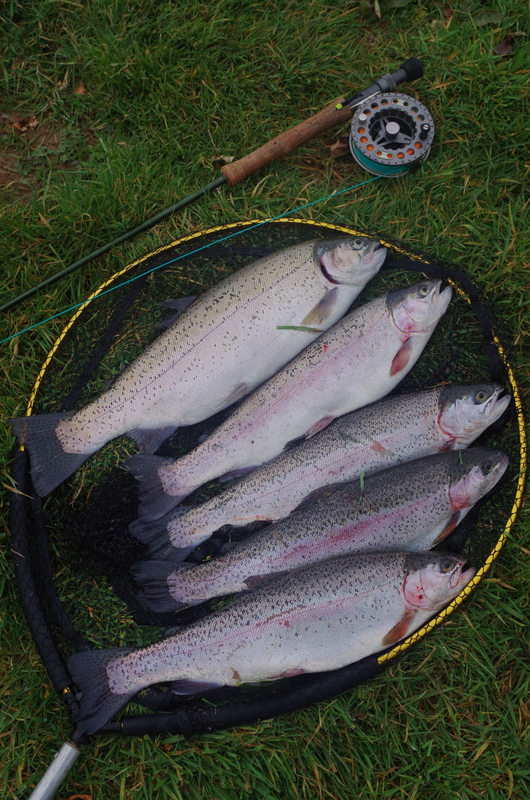 The trout were tempted on a cut throat cats whisker which was invented by his fellow angler friend Richard. 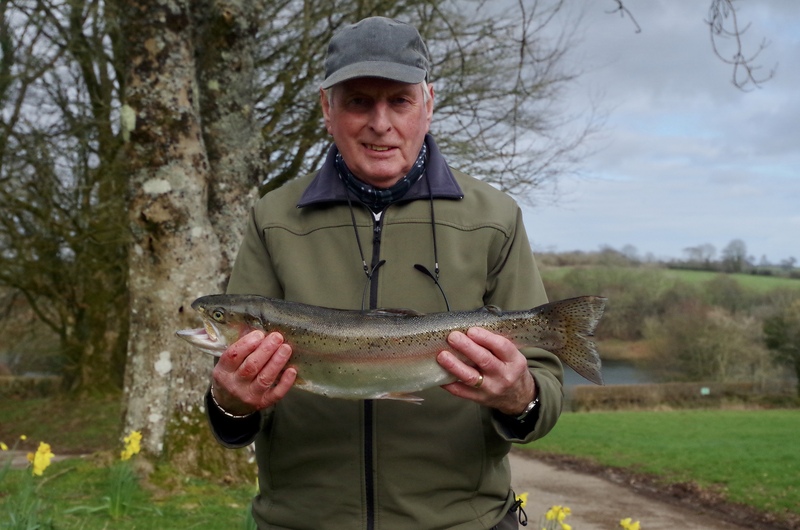 (Below)A very good day at Wimbleball for Peter Davies on the right and John Ratcliffe with 9 fish between them up to 6lb 10oz.